November 19, 2015: Following the order of National Green Tribunal (NGT) a Joint Inspection team of Central Pollution Control Board (CPCB and Delhi Pollution Control Committee (DPCC) visited the Dioxins and heavy metals emitting unapproved Chinese incinerator technology based municipal solid waste (MSW) based power plant of Timarpur-Okhla Waste Management Co Pvt Ltd (TOWMCL) of M/s Jindal Urban Infrastructure Limited (JUIL), a company of M/s Jindal Saw Group Limited. The joint inspection team visited the factory from 10 AM- 11.45 AM on November 19, 2015 along with Anant Trivedi, Dr U C Bahri, K S Rao and A B Akolkar, Member Secretary, CPCB and Bharat Sharma of CPCB, B.L Chawla, Senior Environment Engineer, DPCC, Dr Anil Kumar, Department of Environment, Government of Delhi, Rakesh Agrawal, Executive Director, TOWMCL and Neelesh Gupta, whole Time Director, TOWMCL. Gopal Krishna of ToxicsWatch Alliance which has been opposing this plant because of its hazardous technology since March 2005 also joined the inspection team at the request of the residents. The NGT case is named Application No. 22 of 2013 in NGT. The next date of hearing is on December 14, 2015. Residents of Delhi's Okhla locality await relief and justice at least since 2009. Environmental groups have been opposing this plant since March 2005. 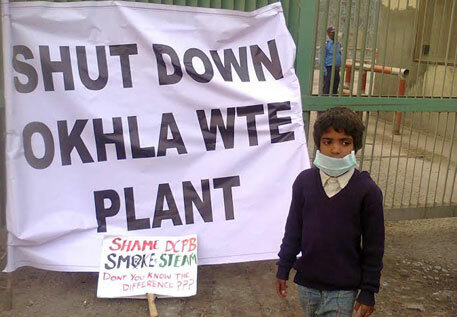 The Show Cause Notice issued to the plant of Jindal's TOWMCL reveals unambiguously that the its Consent to operate under Air (Prevention and Control of Pollution) Act, 1981 & Water (Prevention and Control of Pollution) Act, 1974 granted by Delhi Pollution Control Committee (DPCC), which exercises the delegated powers of CPCB had expired on 20th March, 2013. The plant is operating without the same since then. But DPCC has failed to order its closure despite such blatant violation of law. As per the website of TOWMCL, it is claimed that the plant received Consent to operate on 21st December. 2011. The fact is that the plant is operating without consent to operate since 2013.
generating 16 MW of power. The report mentions that the plant was supposed to use RDF technology but refrains from mentioning that it is using an unapproved Chinese technology brought to light by the CPCB committee report prepared pursuant to 22th March 2011 dated order of the then Union Minister of Environment & Forests. This led to the official recognition of deviations from approved technologies. The Chinese technology provider is from Hangzhou New Century Company Ltd of Hangzhou Boiler Group. The High Powered Technical Experts Evaluation Committee of CPCB in its 31 page report on the Timarpur-Okhla Waste to Energy Incinerator Plant brought to light the illegalities committed by Jindal's TOWMCL. The report was communicated on March 22, 2012. This report is based on three meetings of the Technical Experts Evaluation Committee held on April 26, 2011, August 11, 2011 and September 22, 2011 under the chairmanship of Chairman, CPCB. Notably, substitution of technology is prohibited under the provisions of the Environmental Clearance. It is deemed dangerous to according to a report of CSIR-National Environmental Engineering Research Institute (NEERI). Notably, the representatives of GTZ (German Technical Cooperation) led by Dr. Juergen Porst, Senior Advisor stressed the need for a Disaster Management Plan in the very first meeting of this CPCB Committee, which is annexed to the CPCB's report. This finds reference in the minutes of the meeting annexed with the report. It underlines the possibility of disaster from the Timarpur-Okhla Waste to Energy Incinerator Plant, which is situated in a residential area. that "directions u/s 31 (A) of the Air Act, 1981 was issued on 03.07.2014 and simultaneously show cause notice was issued for refusal of consent under Air & Water Act and authorization under MSW Rules. The Project Proponent has filed statutory appeal against the directions dated 03.07.2014 before the Ministry of Environment & Forests, Government of India. The appeal was listed for 27.02.2015 and the same is pending. The matter is to be listed for final hearing and the next date of hearing is yet to be notified." The ToR given by MoEF's Experts Appraisal Committee to the project in question specifically demanded "Disaster Management Plan" but the High Powered Committee constituted by the then Union Minister of Environment & Forests headed by Chairman, CPCB observed in its report that this plan has not been prepared. It condemned the non-cooperation by the company. This committee noted that this plant is operating in violation of Municipal Solid Waste (Management & Handling) [MSW] Rules, 2000. It came to light from the observation of A B Akolkar from CPCB. Akolkar is currently the Member Secretary of CPCB. He was part of the Join Inspection Team that visited the plant on November 19, 2015.
crematoria". With regard to "Residents from 7 to 64 years old living within 5 km of an incinerator and the incinerator workers" the judgment observes, "Levels of mercury in hair increased with closer proximity to the incinerator during a 10 year period". around an incinerator and other pollution sources" showed "Significant increase in lung cancer related specifically to the incinerator". The "People living within 7.5 km of 72 incinerators" displayed "Risks of all cancers and specifically of stomach, colorectal, liver and lung cancer increased with closer proximity to incinerators". The Court had observed that "This is a mandatory requirement of the guidelines issued by CPCB, that such facility should be far away from residential and sensitive areas" The same holds true for the location of the Jindal's municipal waste based incinerator plant. This order of High Court underlines that its approach to environmental damage is better than that of NGT. The plant is amidst residential colonials and institutions of national importance like Central Road Research Institute, Institute of Genomics and Integrative Biology and the Indian Institute of Information Technology. Such toxic emissions from the Jindal's power plant in an ecologically sensitive area and thickly populated area has become a routine affair with all the concerned authorities turning a blind eye towards this illegitimate and illegal act. This plant has violated all the rules in the rule book. Besides violating all the relevant laws and rules, this plant is violation of Wildlife Protection Act 1972 creating a compelling reason for the closure of this plant. The plant became operational in 2012 but it is using untested and unapproved Chinese incinerator technology, a fact noted in the report of the Central Pollution Control Board committee constituted after a delegation had met Shri Jairam Ramesh, the then Union Minister of Environment & Forests pursuant to his site visit of the plant. It is noteworthy that the Union Environment Minister had written to the then Chief Minister, NCT of Delhi underling that the plant is functioning in violation of environmental regulations. Notably, this plant does not have clearance from the Delhi Urban Arts Commission, which is a mandatory requirement. This plant is in a green belt contrary to the Master Plan of Delhi, in contravention of section 3(2) (v) of the Environment (Protection) Act, 1986, Rule 5 (ix) of Environment (protection) Rules, 1986 and Guidelines for Establishment of Industries issued by MoEF. further subsidies." It is noteworthy that on 15th May, 2007, the Court's order "permit (s) Ministry of Non-conventional Energy Sources (MNES) to go ahead for the time being with 5 pilot projects chosen by them" but it is noteworthy that this refers specifically to bio-methanation technology. MNES is renamed as Ministry of New & Renewable Energy (MNRE) and is part of Power Ministry at present. It has been revealed through RTI that neither the proposed Delhi's waste to energy incinerator projects one of those 5 pilot projects nor is it based on the recommended technology. It is apparent that amendments made in the EC have been made to gain this assistance of Rs 1.5 crore/MW even as the stay by the Supreme Court on sanction of any further subsidies for projects on energy recovery from Municipal Solid Wastes continues to be in force, in manifest violation of Court's order. In the light of the Court's order MNRE must be persuaded to withdraw or modify its letter (No.10/3/2005-UICA) to stop promotion of polluting technologies like incinerators. Supreme Court is quite categorical in saying, "The Committee has recommended that projects based on bio-methanation of MSW should be taken up only on segregated/uniform waste unless it is demonstrated that in Indian conditions, the waste segregation plant/process can separate waste suitable for bio-methanation. It has opined that there is a need to take up pilot projects that promote integrated systems for segregation/collection/ transportation and processing and treatment of waste. In view of the report of the Committee and having regard to the relevant facts, we modify the order passed by this Court earlier and permit Ministry of Non-conventional Energy Sources (MNES) to go ahead for the time being with 5 pilot projects chosen by them, keeping in view the recommendations made by the Expert Committee and then take appropriate decision in the matter." Despite this Delhi Government has erred in supporting illegal waste to energy incinerators in Delhi which is contrary to the Court's order. restored. It was in March 2009 that Writ Petition (Civil) No. 9901 of 2009 which was initially dismissed on 12th August, 2009 because of misrepresentation of facts by the then Additional Solicitor General. High Court later found that it was misled earlier which had led to it dismissing the petition. The Petition was restored by an order dated 15th January, 2010. In the presence of A.S. Chandihok, the bench headed by the Chief Justice, Delhi High Court in the order observed, "that the project in question" and "the location of the pilot project in Delhi was neither recommended by the Expert Committee nor approved by the Supreme Court." In a strange case that one of NGT's order in the case in question relied on reasoning advanced in the dismissal order of High Court and chose not to take cognizance of the Court's restoration of the same case which later admittedly got transferred to NGT. to citizens. The Bench of Chief Justice Dipak Misra and Justice Sanjiv Khanna ordered, "A joint report be submitted by the DPCC and the CPCB after an inquiry of the site of the energy plant about the alleged risks posed to citizens". part of the solution but part of the problem. Now a bizarre situation has emerged because the arguments for Refuse Derived Fuel (RDF) incineration technology that was advanced by the company and the law officers of the previous central and state governments are no more relevant because the plant is using an experimental Chinese technology which was never ever mentioned at the time of submitting the project proposal or in its EIA report based on which a so-called Public Hearing was conducted in Saket. The ongoing protest rallies and an online campaigns against the toxic, waste-to-energy incinerator where students are also participating in large numbers underlines that the operation of Jindal's waste burning based power plant is an act of environmental lawlessness in the heart of the national capital. The closure of this plant will be a major and memorable contribution to NCR's landscape for generations to come and help prevent approval for hazardous industrial units in the region at a time when Delhi's residents are gasping for fresh air. Having been involved with these issues since October 2000 and with this specific issue since March 2005, ToxicsWatch Alliance (TWA) has sought Union environment minister’s urgent intervention for prevention of unfolding public health and environmental disaster in Delhi's Okhla area and adjoining areas of Uttar Pradesh in particular and NCR region in general due to the Dioxins emitting plant of Jindal's TOWMCL. MSW (Management and Handling) Rules, 2000. This experience also shows that energy from municipal waste is not produced at any lesser price in fact it more expensive. The myth of incinerator based WTE plant solving the problem of leachate which contaminates ground water has long been debunked. The existing literature on waste management underlines that incinerator based WTE plants constitute a meaningless and misplaced option. The fact is that it is not a solution, it is a problem creator. It gives birth to the problem of what can be deemed as landfills in the sky. It is a case of putting resources up in flames. It appears strange that Delhi Government is following the footprints of a government whose misplaced initiatives like these led to it being vanquished. It is hoped that the report of the Joint Inspection Team will undo the threat of public health disaster due to the plant’s location in the proximity of the residential colonies.